It occurred to me the other day that I’ve been making music for over fifteen years. That’s quite a long time for what has (typically) been a solitary and (always) non-profitable affair. I have therefore decided to document a brief history of my bedroom studio, foccusing both on its contents and my creative journey (ouch, sorry). This may only interest those with a similar passion, but it’s just something I’d like to put into words. My dad’ll like it, anyway. So, partly to assist me with the postaweek challenge, but also to avoid hitting you with a mammoth blog post, I’ll be posting the whole story in parts over the next two or three weeks. “This is amazing. I don’t need an Amiga now,” I exclaimed as I fired up my second ever game of Brick Breaker on dad’s shiny new Atari ST. 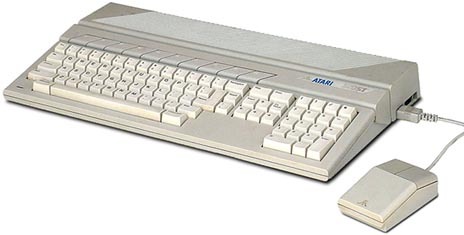 The exact year escapes me, but it would have been some time around the early 90s when the Amiga 500 was the dour grey box that dominated my daily thoughts. It was the one thing I needed in my life. But then, suddenly, my imagination was captured by the unscheduled arrival of it’s weaker opponent (and I’m sure much to the delight of my Amiga’d-out parents). Of course, this post isn’t one of gaming history therefore I digress. The real reason the Atari was sitting in front of me was for dad’s foray into the world of midi and production. At the time, his band, Gold, were all conquering on the wedding and club circuit and along with Geoff, the band’s guitarist, dad had decided to begin producing their own backing tracks, having previously relied on the adequate yet fiddly services of a Roland TR505 drum machine and an even more fiddly and complicated bass player. Initially, the sound sources in question consisted of a Roland D5 synth. The budget version of the D50 was absolutely nothing to write home about, but it provided the bare bones of drums, percussion, bass and strings that a band like Gold required. The Atari ran Cubase (version 1, I think), and proved to be my first ever experience of a computer-based sequencer. I have no recollection of the first time I laid eyes on it, but I remember Geoff and dad spending countless hours inputting drum parts and bass lines. Their attention to detail was incredible and every part was note perfect (after a fair amount of swearing, they even managed to reproduce the over-indulged intro to Gloria Estefan’s Rhythm Is Gonna Get You) and not once did they fall back onto the lift music styled services of midi files. Their enthusiasm obviously caught my eye and I soon asked to have a go myself. The very moment I first laid a hand on that awkwardly square mouse, I was hooked. The D5 provided little sonic inspiration, as mentioned. But as a young boy I didn’t notice. I was just happy to bash keys, input my own drum loops by randomly entering notes on the drum grid and experiment with the exciting discovery of maximum pitch bend adjustment. I can remember little of this early time and can only imagine the racket I must have been making, but it’s where it all started and I’ve not looked back since. By the time I reached my teens, while I hadn’t yet learned to play an instrument (something I still regret to this day), I had developed a new found love for making music and continued to grab any chance I could on the Atari. It wasn’t always a solitary affair, either. Recruiting the services of a couple of friends, we set about recording a ‘live album’. Of course, this wasn’t Woodstock. No, it was simply the trusty D5, a guitar amp and a tape recorder set up haphazardly in one of our garages, but the resulting song, Church Live, is fondly remembered, if not for it’s chorus of manically played, tuneless organ over the crushing sonic backdrop of aeroplane sound effects, but for the laugh we had making it. Another track, Irene Abbot, was also committed to tape at the same ‘session’. Inspired by a local MP who’s name and leaflet campaign gave us enough reason to record what I can only recall as, well… noise, it too rests soundly in the memories of our childhoods. Just a shame we lost the tapes. Or maybe it isn’t, actually. Meanwhile, in the world of Gold, the now seasoned production team of dad and Geoff were on the hunt for a better sonic palette. The D5 had served its course. 1994 was a golden era for synth modules with a flood of them appearing on the market. A few were tried and discarded before they eventually settled on the Yamaha TG300 (pictured). Almost the sole reason for its employment was a demo track which featured an entirely real-sounding acoustic guitar which wowed real-life guitarist Geoff particularly. Of course, with midi-driven Cubase at the helm, they would only have access to the general midi sounds and not the program bank said guitar sat within. However, it was still a supersonic leap from the D5 and offered some very useable sounds along with internal effects such as reverb, chorus and flanger. It even had an onboard mixer with graphical display. It was like something out of Star Trek. It was also an incredible workhorse. Not only was it the primary sound source in the studio, it was also heavily gigged for years. An MDF (midi data filer) on stage sent the TG300 the duo’s hard work and it duly played it back without breaking a sweat. Smoky clubs, raucous weddings and yet more smoky clubs didn’t faze it and neither did my fiddling as sound man, regularly changing levels for the drum and bass parts via the LCD display. It never failed. Once. Over the next couple of years, I continued to beat the thing to within an inch of its life. GM sounds are fairly unforgiving and of course can’t be messed with… unless you get creative with the effects and start doubling up tracks, which I set about doing every moment I could get my hands on it. It was during this period that I started to become what could loosely be described as ‘creative’, putting together relatively complex (for me) drum and rhythm tracks and constructing entire songs as opposed to a few bars of experimentation. My only regret is that I have no trace of these early works; committing anything to tape or CD in those days was ball achingly complicated. Well, ok, it wasn’t, but I did have to see my mates and play football occasionally. Cubase continued to be centre stage and I’m yet to experience a sequencer or DAW which offers the same stability and ease of use that those early versions afforded. It was rock solid and even included features that are oddly absent from modern software. 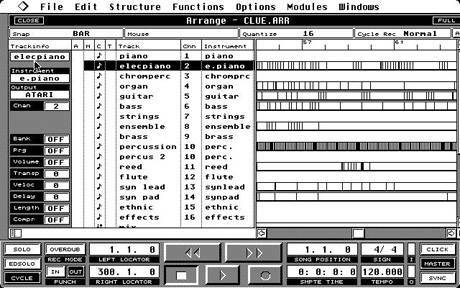 For example, the way you could turn your mouse pointer into a boot and ‘kick’ midi notes around was inspired and something I still wish I had access to today. Also, I’m yet to come across a better drum pattern arranger in any modern DAW. Experimenting yet further, I even managed to successfully hook up a second midi device (a piano module neither dad or I can remember the name of) via the Alice In Wonderland-like world of midi thru. Suddenly, I had two boxes to make noises from. I felt like Trevor Horn. I think I tried remixing “Head Like a Hole” once. It involved, almost exclusively, the default Windows 95 Sound Recorder program as my software manipulation program. Thankfully, that’s long, long gone. Mine’s a bit self indulgent really, but I found it interesting how much I remembered. I really would love to hear some of the stuff I produced though. I think one was a remix of the Tomb Raider theme. We’re talking THAT calibre of production.